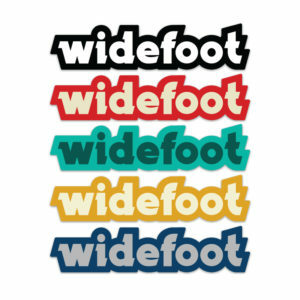 Packs of 3 black and white vinyl stickers featuring the Widefoot logo. Perfect for bumpers, water bottles, laptops and cargo boxes. Widefoot text logo printed in color on white vinyl. 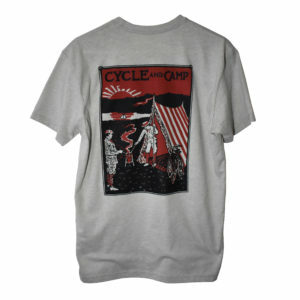 These comfy t-shirts feature cover artwork from “Cycle and Camp”, an 1897 book on bicycle camping by Thomas Hiram Holding. A lot has changed since it was published, but the idea of getting outside on two wheels, pitching a tent, and camping beneath the stars has remained about the same. The shirts are screen printed by our friends at Omaha Screen Co on super soft, ½ cotton, ½ polyester Bella Canvas tees, with red and black ink. Comfy t-shirts featuring the Widefoot logo printed prominently on the chest. The shirts are screen printed in cream colored ink on super soft, ½ cotton, ½ polyester Bella Canvas tees by our friends at Omaha Screen Co. Shade your noggin with this classic trucker hat. Brown cap with khaki mesh, snapback closure, and Widefoot embroidered patch.